Where to Stay in Glacier National Park? Lodges, Campgrounds or Both? We have 4 nights to spend in Glacier National Park. Would it be best to stay somewhere mid-park for 4 nights or stay in the west for 2 nights and the east for the other 2 nights? This is a great question. A lot of people assume that just getting to the park is good enough, but if you want to make sure you see everything you want to, you have to plan accordingly. Here’s what I say: first of all you should decide what kind of sightseeing you want to do. Are you looking to see all the main attractions or to do some more in-depth explorations of certain areas? If you don’t care whether or not you miss this peak or that lake, then I’d say camp out in one spot for those four days and see absolutely all there is to see in that area. If, on the other hand, you’d like to get the full Glacier National Park experience–and surely that’s what you’re after, right?–then two nights in the west and two nights in the east is a perfect plan. The one thing you don’t want to be worrying about while you’re in Glacier, though, is figuring out where you’re going to stay. Do all of this planning well in advance, so you don’t waste more time than you have to with moving from one site to the other. A great way to do this is by making reservations way ahead of time to any number of fantastic lodges, resorts, or hotels. These can become kind of expensive places to stay for longer trips, but for just four nights, I think it’s the best way to go. 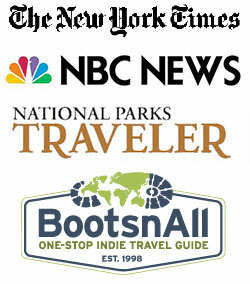 You can check out the full list of Glacier National Park lodging options here, but I thought I’d sum it all up for you. By far, your best bet over here is the Lake McDonald Lodge. This is a super cozy place to shack up, and it’s perfect for families. There’s just so much to do at the lodge itself, including: horseback riding, trail hiking, fishing, boating, shopping, and swimming. Glacier Park Lodge is probably the most famous in this area, but in my opinion it’s one of the worst places to stay–too touristy. Instead, check out Many Glacier Hotel and Lodge. Nestled on the shores of Swiftcurrent Lake, this five-story Swiss-chalet-style hotel is nearly as beautiful as the wilderness around it. There are benefits to both. I always love to camp and spend one night in Many Glacier Hotel. Glacier has a great array of camping options. You can reserve a campground online here, or otherwise it’s a first come-first-serve basis. Unfortunately, the only 2 campgrounds you can reserve are Fish Creek (awesome, but far removed), or St Mary, which is exposed and my least favorite campground. Check out the full list of Glacier National Park campgrounds here. I hope this helps you make your decision. In all honesty, no matter where you stay, for however long that may be, you’re bound to have an absolutely awesome time. In the west, the east, and the middle–in a hotel, campground or both–there are amazing outdoor experiences aplenty. Have fun and let me know what you decided as far as lodging goes! If anyone has a favorite hotel, you can share your experieinces here!